In my previous post, I have explained to you about the advantages of using Infowise ultimate form actions compared to workflows. 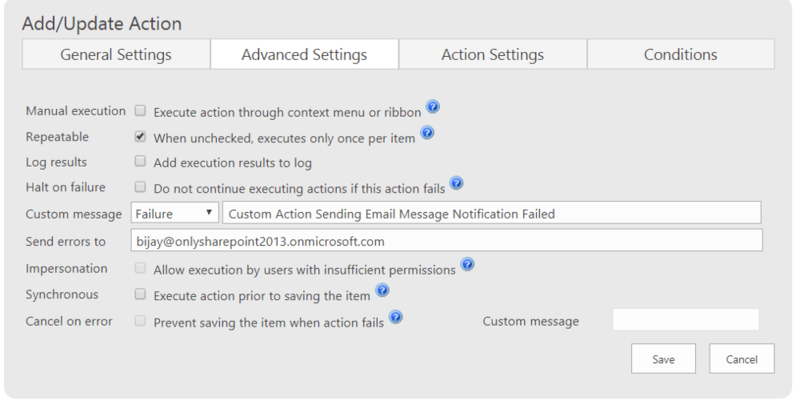 Here we will see some examples how easily we can use Infowise actions to send notification emails to users whenever any operations (Insert/update/delete items or any document attached to item) happened in SharePoint online document library or list, for any business requirements needs instead of creating workflows. Also read one of my post on InfoPath alternatives for designing SharePoint Forms. Every organization has requirement to send notifications whenever user adds an item to a list or uploads a document to a document library. We might not need to create a task for a particular user. So here we can decide whether we really need to create a workflow using designer or using any 3rd party popular products like Nintex workflow. You can read an article on licensing comparison of Nintex and Other products. Here I will show you how easily we can do these things using Infowise ultimate form actions. Open Infowise Ultimate Forms app from Site Contents page and then we can choose the particular list and configure the actions from “Configure Business Logic” section. There are 4 tabs available to configure the action, easily you can do in the browser itself. We will go through one by one and the importance of each settings. Here lots of important options are available which we can do by just ticking on few checkboxes. We can set manual execution, can send action failure notification to people, so that they can get notified. One more important things, by ticking a checkbox we can make the action run in an impersonation mode. In workflow you need to put all your actions inside an App Step, here just check a checkbox. Another important thing you can do is you can prevent the item from saving if the action fails. We cannot do this things in workflow because workflow will trigger after item created. We usually need to write some js code on presave action or we can use some event handlers. So it is very easy in case of Infowise actions. In the action settings we can use the lookup box to populate the fields. See here I have send the email to user and then have created the Subject line and body. There are lots of form fields as well as formulas available which we can use inside the email subject and body. You can see we can send the item URL link in the email simply by using the variable [List URL]. You can add any conditions if you want but here I have not used any conditions. Once you Save the action, it will display in the Actions sections what are the actions attached to the list like below. As a developer we always have issues moving things from one site to another site or one site collection to another site collection. Infowise provides Export and Import option. By using export we can export an Action and by using import option we can import an existing action to use it in any other list or document library. Here we have checked how easily we can send email notifications not only in Item added, edited, we can also send notifications on attachment added and attachment deleted which we cannot achieve using workflow not even using Nintex workflows or any other 3rd party workflows. In other articles we will go through more and more advantages of using Infowise Ultimate forms and actions. You can sign up for a trial of Infowise Ultimate Forms now.